"Listening to John Coltrane's recordings during the period when he was first trying to form his own band, you hear some tremendous drummers on the dates, like Art Taylor." Art Taylor played in a church in Harlem with Sonny Rollins and Jackie McLean and worked with Howard McGhee in 1948. He performed with Coleman Hawkins (1950-51), Buddy DeFranco (1952), Bud Powell (1952-54, and at intervals to the mid 1960s), Art Farmer (1954-55, recording in 1955), George Wallington (1954-56), and Miles Davis (1955-57, recording in 1955 and 1956). 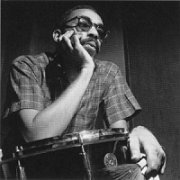 In New York he led the group Taylor's Wailers at The Pad, a club in Greenwich Village, until 1956; he also made several trips to Europe, the first of which was with Donald Byrd and Bobby Jaspar (1958), and played with Thelonious Monk (1959). While living in France (from 1963) and Belgium (from 1970) he played frequently with Johnny Griffin and toured the U.S.A. A collection of his interviews with other jazz musicians was published as Notes and Tones: Musician to Musician Interviews (1977) and after returning to New York in 1984 he was the host of an interview program on radio station WKCR. Taylor recorded prolifically (especially in the late 1950s) and may be heard on nearly 300 recordings, including John Coltrane's Giant Steps (1959), the title track of which well illustrates Taylor's bop style. Arthur Taylor may have an outward veneer of aloofness but don't let it fool you. No one is more involved or more serious about his music when he starts to play. He has the grace of a panther but coupled with it is the intensity of the tiger. A. T. is not a flashy drummer but you always know he is there. "A drummer should keep time and swing while doing it," he told me during an interview for a Down Beat article (October 13, 1960). This statement is not particularly startling but Art gives it meaning by living up to it. His has been a growth from a nervous young kid, so anxious to swing that he rushed tempos, to a mature, polished artist. This is not a recent development. A. T. has been an important part of the combo scene in New York for quite a while now. His recordings, as a sidemon, are countless. As a result, he has been written about on numerous album liners. The usual information states that he was born in New York City in 1929, played in a neighborhood band with Sonny Rollins and Jackie McLean while growing up in Harlem and is stylistically descendant from Max Roach and Art Blakey. That he has played with such important musicians as Bud Powell, Miles Davis and Thelonious Monk is well known too. Sometimes one takes it for granted that everyone knows these facts and is loath to repeat them again. But there are always new listeners and this is Taylor's first Blue Note album as a leader. A. T. is one of the most sought after drummers in highly competitive New York jazz circles. It is, however, more than this relative security that keeps him from putting together a group of his own. With the rise of the drummer-combo leader in the past few years, certain people have been urging him to front his own quintet. Art feels he isn't ready, the main reason being the impossibility of getting, on a permanent basis, the musicians he would want. Arthur Taylor is the steady supporter that every drummer should be. He exhibits much controlled strength and is always interesting. When his solo spots come, he fills them with well-structured, crusply executed thoughts. As a leader he takes care of the non-playing details with equal aplomb. Clearly, A.T.'s Delight is ours as well. A selected discography of Art Taylor albums. A.T.'s Delight, 1960, Blue Note. Wailin' At The Vanguard, 1992, Verve.